It was extremely lucky for us to choose Annapurna Foothills Treks for our trekking trip to Nepal. We are really grateful for the guide and service that was provided throughout our whole trip. We have zero experience and knowledge about trekking (in addition to coming there on Winter time). Hence, we were definitely under-prepared for our trekking tour through Lukla, Pakdhing, Namche Bazaar, and Syangboche, ending in Everest View hotel. In addition, we were physically unfit to deal with the high elevations, didnt bring appropriate gears, and more. Nevertheless, through our struggles we can see Ngima's deep experience and knowledge in trekking. He is organized, while haste, reliable in making extreme schedule changes to accommodate our pace (from horses to planes) and our high lodging expectations. Ngima also provided us with rich insights to the culture, politics, ethnic history of Nepal. All in all making the trip an extremely pleasant one. We are really grateful as a four person family to have trekked in Nepal and meet Ngima, Tenzin Dolma, and the Annapurna Foothills Treks family - making this an unforgettable trip. I first met Ngima in 2007, while on the Annapurna Sanctuary trek. Ngima was guiding for a different group, but the two groups became friendly and trekked together for several days, during which time I was impressed by Ngima’s friendly, helpful nature. 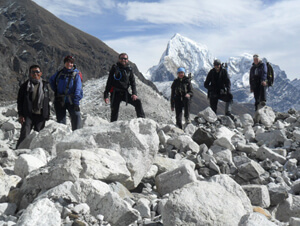 His group were also full of praise for the excellent service they were receiving from him, so I decided that I would use his guiding services on my next visit to Nepal. I returned to Nepal with my girlfriend in 2010, this time to trek in the Everest region. In advance, I contacted Ngima via email and was delighted when he agreed to guide us. 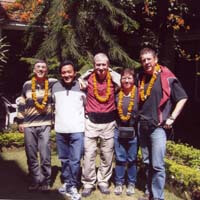 All the arrangements for the trek were organised via email – it was very easy. The trek itself was fantastic, made all the more special by Ngima, who was genuinely concerned with giving us the best possible experience. When minor problems arose (eg. overcrowded lodges), none of which were his fault, he always found a solution. During the trek, Ngima was a constant source of information, giving us a much better understanding of the culture and landscape we were trekking through. This made it an even more fulfilling experience. Ngima really is an excellent guide. He is friendly, caring and well organised, with an excellent grasp of English, making communication very easy. He also speaks very good Spanish. I would happily recommend him and would encourage anyone to use his services. - Very professional organization: Ngima has always regard for meeting times and respect of schedule. - Very good, various and wholesome food. some time, during the trek, we spent a long time at noon to wait for porters and to wait for lunch: an enhancement can be, for some days, to have a cold picnic for lunch and to avoid a camp installation at noon. Is’ all! See you soon in a next trek. 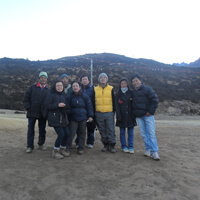 Thank you very much for your praiseworthy hospitality during our trekking tour in Nepal. We are very much happy and satisfied with your guiding throughout the trip. We could have never known these beautiful mountains and amazing people without your well planned and managed trip. We highly recommend the Annapurna Foothills trek and expedition as one of the most reliable and satisfying trekking company in Nepal.